Today is Good Friday, the day on the Christian calendar when we remember and reflect upon the crucifixion of the Lord. Some of us will get together at a local church and hear the Gospel account of the cross. Others of us will spend some time alone reflecting on the death of Jesus. In whatever way you choose to recognize this pivotal moment in human history, I pray that you will appreciate the awesome transaction that took place on the Palestinian hillside nearly two millennia ago. I hope you will rejoice over that moment when Jesus cried out, “It is finished”, and gave up His spirit (as John 19:30 tells us), that moment when every member of the human race was offered reconciliation. We are offered reconciliation with God, since we know that the cross resulted in the full forgiveness of sin, pardon from our willfully disobedient nature that separates us from our creator. Jesus (who committed no sin) gave His life for us (who are sinful) to completely satisfy the wrath of God. Instead of suffering the appropriate consequences for our actions, Jesus paid the price with His life and enabled us to reunite with God. Through the death of Jesus – the public, ghastly and humiliating death of Jesus – we are declared forgiven and allowed entrance into the heavenly realms. Before Good Friday, all people were separated by a wall of hostility into two camps – those who were under God’s covenant and those who were not. This separation is a symptom of our sin and caused people then, as it causes people now, to divide one another into two distinct groups: us and them. We like us and we hate them. Today’s divisions are no longer about rabbinical interpretations of Old Testament law, but of gender and politics and class and ethnicity. The cross has destroyed the dividing wall of hostility. Rejoice today that we are reconciled with our Creator and with our fellow-created through the cross of Jesus Christ. We need never be alienated from God or from our neighbor because of Christ’s sacrifice on Good Friday. When we stand before the cross today, literally or figuratively, let us all remember that through His death we gain peace with God and unity with all those who stand beside us. I pray you will accept His offer of reconciliation and receive the peace that passes all understanding. I wish you all a happy and healthy Easter. Father James Lavelle: I think there’s too much talk about sins and not enough about virtues. Fiona Lavelle: What would be your number one? Father James Lavelle: I think forgiveness has been highly underrated. If you’ve been watching the news or following the internet streams of current events, you may come to the same conclusion as that priest – we talk about sin too much and forgiveness not enough. We can quickly and easily make a mental list of all the wrongs we have suffered, all the offenses we’ve witnessed and all the transgressions we’ve committed. I fear that the church often defines people by their sin (past or present): ‘he cheated on his wife’, ‘she was hooked on heroin’ or ‘those parents aren’t married’. Is it possible to change the discussion and begin listing virtues instead of vices? Can’t we say, ‘she remains committed to her marriage despite their difficulties’ or ‘he has been clean and sober for 1,000 days’? Perhaps it is easier to remember the offense and become calloused by sin. It may be easier, but not better; easier, but not right. If we understand forgiveness – a financial term before it became a spiritual term – we know that it means that we no longer demand payment of a debt; that our right for recompense is cancelled. In light of scripture, we also know that our debt has been cancelled (since another fully paid for it in full) and therefore we ought to be gracious in extending the forgiveness that was fully extended to us. Ursula Ward, whose son, Odin Lloyd, was murdered nearly two years ago, understands the difference between what is easy and what is good. Earlier this week, she was in a Fall River court house giving testimony. Toward the end of her victim impact statement before the judge who presided over her son’s killer’s trial she said, “I forgive the hands of the people who had a hand in my son’s murder, even before or after.” Her testimony forces me to pray for two things: first, that the Lord spares me from enduring the kind of suffering Ms. Ward is experiencing; and second, that if that cup could not pass, that I would have the faith and fortitude to forgive. 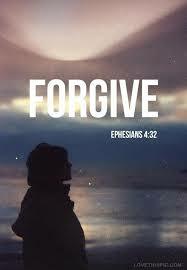 Will you imagine with me how much better life would be if we just chose to talk about sin less and forgiveness more? I know that the wages of sin is death and I know that the gift of God is eternal life through Jesus Christ, His son. Lord, allow us, before we pass judgment with our words, to pass on grace with our demeanor.